Since my master studies, I built and maintained a personal research database and interface. It is geared to support the management of the primary sources I use and to process the information that derives from them. From time to time I will make some improvements to the interface or the underlying database structure to make my life simpler when I want to extract data or to work through the analysis of some texts. Recently I have taken upon me to make two major improvements to the display which turned out to be very simple to implement. 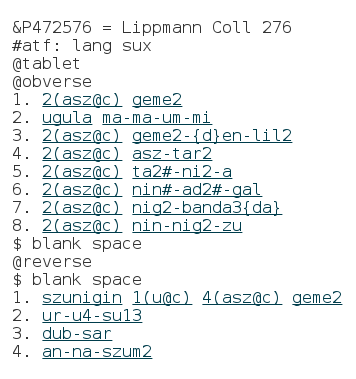 The links lead to the individual view for the token, the lemma and the word type, this last display shows a list of lemma of this type in the corpus. At some point I will upload my transliterations to the cdli since in order to make it easy to computationally process the data from the text, I harmonize all readings across the corpus, readings which are based on a dozen authors and my own work. Sometimes it would be helpful to know exactly what is the difference between my transcription and the one offered in the cdli which can be modified by any cdli editor. Because we recently set up daily data dump from the cdli, I was able to set up on my own computer a daily download of the file so I can use it for comparison. First I create a shell script to grab the file and inflate it and I have this script run daily as a cron task.